The release notes of DbFace. DbFace V6.5 released at 2016/12/05. DbFace V6.4 released at 2016/11/29. [BUG] SSO bug, sso will redirect to DbFace login page in some cases. [NEW] Stacked option for chart report, you can make multiple series bar, line chart stacked. [Bug] The public url will be lost after edited parameters. [Improve] Use space as tab, and set tab size to 2 for all editor. DbFace V6.2 released at 2016/10/18. [Improve] We changed to use source editor for HTML report. DbFace V6.1 released at 2016/10/14. DbFace V6.0 released at 2016/10/03. 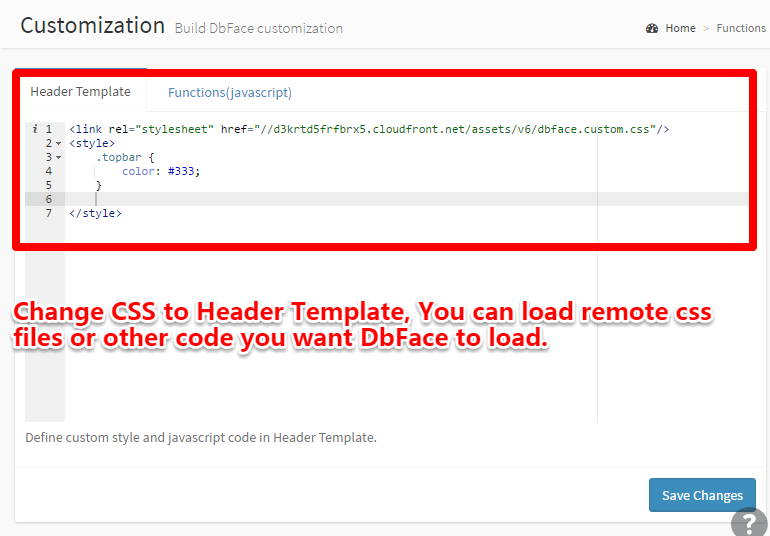 Since V6.0, You can install DbFace on prepared PHP 5.3+ (PHP5.3, PHP5.4, PHP5.5, PHP5.6, PHP7) ready webserver(Apache, IIS, Nginx). [Feature] Batch edit user permissions for applications in category. [Improve] Many other minor improves. [Feature] Enhanced SQL workshop that you allow test your SQL queries on the fly. [Feature] We have changed Custom Css to Header template. [Improve] New application categories system. [Feature] Story report, navigate reports page by page.